We had a very successful pelagic trip out of Whakatane to White Island and the Volkner Rocks organised by John Brierley on Sat 9 March. The weather was very fine and sunny, with a light northerly and almost no swell early on, building to about 1/2 metre swell in the afternoon. We left the Marina at 0900 and headed out over the bar past Motuhora Island (Whale Island). Several little penguins were seen briefly and then scattered flesh-footed, fluttering and Buller’s shearwaters were seen on the way out. About 3/4 of an hour off White Island a large dark as seen at a great distance, and was probably a giant petrel. A little bit later an approx. 8ft Mako shark was spotted on the surface. The Australasian gannets were still attending sites at the White Island colonies, with several juveniles spotted floating on the sea near the island. Many chicks were still to fledge. We circled the island passing around the eastern side of the island around to the seaward northern coast and then around to the western shore, scanning the cliffs as we went for any sign of grey ternlets. 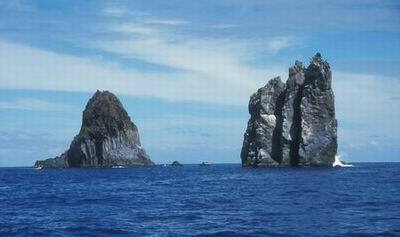 We then headed across towards the Volkner Rocks, about 3-4 km west of White Island. We circled the big rock first, scanning for grey ternlet, but no luck, then headed to the western most of the smaller two. On the western side we spotted 4 birds roosting on a rock and they took flight, and we then headed around the southern to the eastern side of the rock and there were approximately 21 birds roosting on a rock. I managed to get a number of photos before they flew, and suspect that some of the birds may have been juveniles due to darker grey-brown plumage on the nape and mantle (I should be able to tell from the photos and get an estimate of numbers of adults to juvs). 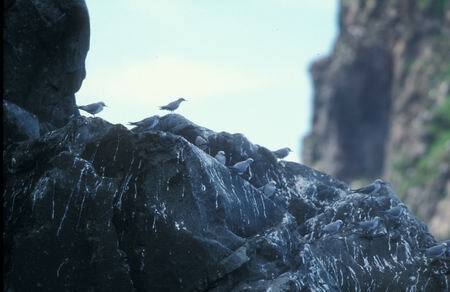 So an estimate of 25 birds was made for the rock, the other small rock did not have any sign of ternlets. We headed back to the larger rock to try and locate the 21 birds that had flown, but they did not show themselves so may have headed off out to sea. 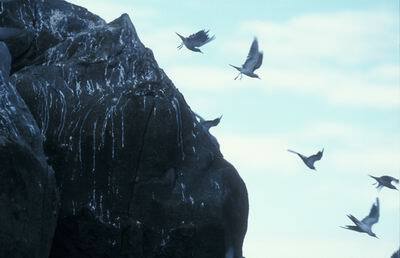 We headed back in towards Whakatane at 1400, and on the way saw another 3 grey ternlet. This was a real surprise, and suggests that with 25 odd birds on the rock during the middle of the day, and another 3 spotted in a straight line between the rocks and the shore, that a population of 50 or more could be present this summer. All in all a great day, and the lack of other seabirds was more than made up for by the excellent views of grey ternlet. 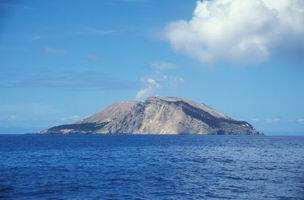 Volkner Rocks, to the west of White Island. The rock on the right hand side is the one that the ternlets were roosting on.